Inventory your network in minutes! Hardware and software tracking done right! 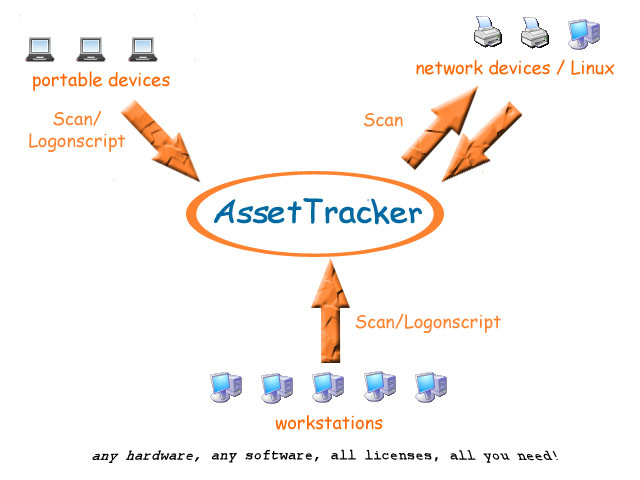 AssetTracker is a inventory software that shows you all infos in your Windows network including License-Management and history! If you miss a feature, you may add whatever you have in your mind, like a registry key, via a 100% transparent VBScript. Try it out AND ALSO USE it for free now! Track any soft- and hardware in your network including license-management. 100% compatible from Windows NT on up to Windows Vista. An innovative and easy-to-use GUI. No other special hardware or software is used. Just a SMB-share on the OS of your choice! Snapshots - Look up, what kind of hardware/software was installed or removed! You miss some data? Add it on your own via a 100% transparent visual basic script! Additional tools and settings can be applied to computers directly in the GUI. Auto-Update to always stay up-to-date and benefit from later developments for free! Let AssetTracker help you take control, before it takes control of you!